Wonder Woman At Super Hero High is the first young adult novel by Lisa Yee tying into DC Comic’s Super Hero Girls line and it is awesome! A young Wonder Woman yearns to leave her familial home on Paradise Island and attend the premier school for young supers her age - Super Hero High! Yee does an excellent job at incorporating Wonder Woman’s - or Wondy, as she comes to be known - youthful enthusiasm, while incorporating character traits and quirks that one would suspect from a girl going to school in a foreign country. Wonder Woman isn’t the quickest to pick up jokes - Harley Quinn even tells her, “Don’t be so serious.” (!!!) - or understand some of the social norms at Super Hero High - like clubs. Yee balances these very true-to-life behaviors of a young modern girl against the character traits seasoned DC Comics fans have come to expect from the Amazonian princess. Wonder Woman is exponentially stronger than her new friends - hitting Steve Trevor in the head with a plate that leaves him with a nasty welt - and an overwhelming sense of justice that endears Wondy to her friends, while putting her in the bad graces of Super Hero High’s mean girl clique. Buried amidst super powered hijinks that include an inter-super-school triathlon competition Yee has several important life lessons. Wonder Woman has a healthy appetite and won’t be made fun of for it. Wonder Woman encourages her shy friend Poison Ivy to step outside her comfort zone by accompanying her to several clubs. Wonder Woman communicates with her mother, Hippolyta, regularly and takes her advice with humility. As a feminist icon it is nice to see that this version of Wondy is living up to her potential as a role model for the intended audience of Wonder Woman At Super Hero High. 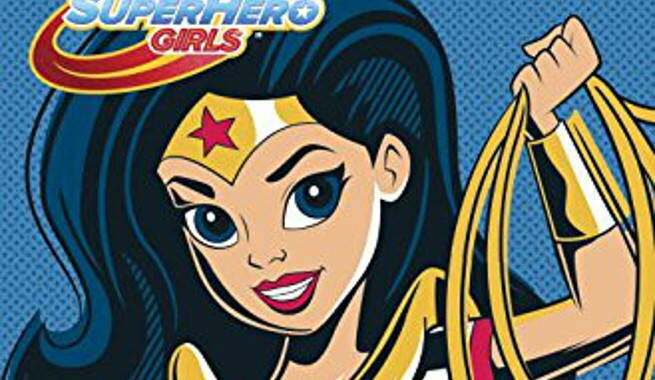 This book isn’t just a cute reimaging of DC’s most classic characters under the DC Super Hero Girls umbrella, it has deep ties running back to through the mythology of the comics going all the way back to the 40s (why not check out my tie-in Easter Egg list? ), and incorporating characters that perhaps don’t immediately spring to mind - The Fiddler, anyone? The considerable thought and research Yee has obviously put into Wonder Woman At Super Hero High and her quick, witty wordplay go along way toward making it not only a fun and valuable read for the targeted demographic (that being young girls), but for older teens and adults as well - or just your straight up Wonder Woman fans! DC Super Hero Girls seems to being trying to expand the brand, while at the same time raising awareness of and celebrating some of the lesser known characters in the stable and Wonder Woman At Super Hero High succeeds in both of those aspects as effortlessly as Hippolyta rearranges the boulders in her front yard. It is super fun, super satisfying and super well executed. Plus, Lisa Yee leaves the reader at the end of the book demanding to know what is going to happen in the next installment. Wonder Woman at Super Hero High is absolutely worth picking up as it hits bookstore shelves today! Or grab your very own right here!